"I'll hold the beast off!" Seoni cried as she stepped up to the dragon, her staff flaring with defensive fire. Merisiel looked to the hulking… uh, hang on [shuffles index cards] combat maneuver defense? Um, these must be for a different— wait, since when do I even use index cards? - Troi actress Marina Sirtis accepted the invitation to appear in this episode without reading its script; she simply asked what the installment was about, and the prospect of working with Barclay actor Dwight Schultz influenced her into accepting the offer. Concerning the experience of returning to the set of a Star Trek television series after having worked for years on Star Trek: The Next Generation, Sirtis commented, "It was surreal, really weird. I didn't get to work with any of the Voyager cast because all my scenes were on Earth with Dwight [....] The [production] crew was virtually the same as we had for two or three seasons, so I knew everybody and everybody knew me. And with Dwight, I was working with someone from The Next Generation, so it was almost as though I'd gone back in time. It was so strange, but so much fun. Of course, I got all depressed when it was over and I had to leave! [....] The crew on Voyager [...] said to me, 'We really miss you guys.'" - A shot of Robert Duncan McNeill as Nicholas Locarno from TNG: "The First Duty" was clearly used as the photo of Tom Paris on Admiral Paris' desk. - This was the last episode of Star Trek to air in the 1990s. - This was the first time Starfleet Headquarters was seen after the Breen attack on Earth during the final weeks of the Dominion War in 2375, depicted in DS9: "The Changing Face of Evil". Most of San Francisco, including the Golden Gate Bridge, had evidently been restored by this time. - In the Pathfinder holodeck, the holographic Torres shoots two (real) Starfleet security officers with a holographic phaser and it has no effect. This is one of the very rare occasions when holodeck safety protocols are seen functioning correctly. - Although The Doctor doesn't mention it at the ending celebration, he met a holo-recreation of Reginald Barclay in "Projections" [FanFare link --ed. ], where he learned that Barclay was a part of the creation project of the EMH, testing the EMH's interpersonal skills. 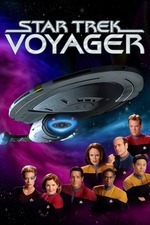 - The holographic Voyager crew are all dressed in their season 1 attires, including Janeway's hair bun, Paris' lieutenant pips, and Chakotay and Torres in Maquis fatigues. Harkins' briefing for Admiral Paris mentions that Pathfinder's projection of Voyager's location takes into account the information that The Doctor brought to Starfleet from the episode "Message in a Bottle" [FanFare link; warning: long discussion on worldbuilding and speculative holodeck physics --ed.]. "Has it ever occurred to you... that a tachyon beam directed at a class-B itinerant pulsar could produce enough gravimetric energy to create an artificial singularity?" "I can't say it has." "We've waited a long time for this moment." "And to the newest honorary member of the Voyager crew, Reginald Barclay. Whoever you are." "Why the long face, Mr. Barclay?" "Because... because, it's over, sir." "No, lieutenant. I'd say that Project Voyager is just beginning. Thanks to you." I found that, on this rewatch, I had to sort of tune out a tiny critical voice that kept whispering "ENT finale, ENT finale" at me. And while it is a fact that this episode is really all about Barclay, I'm glad I was able to set aside that ENT-finale factor, because whatever weaknesses this episode carries as a result of its TNG-dependent, Alpha Quadrant-centered conceit are counterbalanced (in my view) by a solid performance by Schultz, very good villain-but-not-really performances by Richard McGonagle as Harkins and the always-reliable Richard Herd (Seinfeld's Mr. Wilhelm) as Nu-Admiral Paris… and when you get right down to it, a script that works in spite of its conceit. The story ramps tension in a low-key but engaging way, and the payoff has real emotional impact even after multiple rewatches. My sincere hope is that no above-the-fold FF text of mine will ever be nerdier than this one. It still bugs me that while everyone else in the episodes refers to Barclay's department as The Pathfinder Project (usually shortened to just Pathfinder), Admiral Paris keeps calling it Project Voyager. More inconsistent continuity or a sly jab at the higher ups in an organization being out of the loop even in the 24th century? Also, the Internet was pissed about "I've decided to ask Captain Picard for help" even back in 1999. I'd have settled for an establishing shot of Earth with the Enterprise-E in orbit. As for the episode, it's really good. The cynic in me says that the showrunners did this in part to try to get a ratings bump from TNG fans who weren't tuning in for this show (if I'm reading the subtext of the MA bit about the trailer correctly, Picard was mentioned to lead to the false impression that Patrick Stewart would have a cameo), and maybe that was part of it, but it works regardless; Reg's motivations for straddling the dedication/obsession line are completely in line with his established characterization, and I noted Harkins' description of Reg's holodeck activities as a "relapse." (Agreed that Harkins is a bit more than the usual bureaucrat-getting-in-the-hero's-way stereotype. Having his sister-in-law's name be Hope was a nice touch.) Admiral Paris' appearance (and using Nick Locarno's picture!) was also good; I wonder if the previous contact from the DQ might have led to an ad hoc Voyager friends and family support group, with Owen Paris, the Kims, Samantha Wildman's husband, and maybe even the surviving ex-Maquis, Miral, and Janeway's ex-fiance Mark. It certainly would be awkward to find out someone's been interacting with a holo-recreation of you. HOLO-SEVEN: I am the Goddess of Astrometrics! Particle of the Week: Tachyons, although I was a little surprised it wasn't verterons given the wormhole talk. Pointless STO Comparison of the Week: There is a scene in Beyond the Nexus where you are teamed up with Geordi La Forge and the villain traps you in a holodeck simulation with no safeties (a shockingly rare event in the MMO). After you prevail, one of the holodeck NPCs offers to thank you by doing 'anything.' After you hurriedly refuse her awkward advances, La Forge comments that the program was devised by Reginald Barclay. He's also honored with a starship ability called 'the Barclay Maneuver,' which is a clear riff on the Picard Maneuver. * Crew: 137, even though Reg heatedly cites '150.' This is a recurring theme. * Credulity Straining Alpha Quadrant Contacts: And this makes 14. It's true that they're making a concerted effort, but see below. * Wilhelm is Nick Locarno's dad! This has been adequately covered in the post, but Herd always really jumps out at me, and I'm still irritated by the Locarno/Paris thing. * Starfleet doesn't know where Voyager is. Normally, this might seem a little nitpicky, but they literally put this episode directly after Voyager leapt another 1000 LY, just to kinda highlight that Voyager isn't following any sort of anticipated trajectory based on their engine specs. The gravity sled doesn't even use a naturally occurring anomaly that Starfleet might be able to observe at a distance. - Their course was unpredictably altered for a lengthy period of time in The Killing Game by the Hirogen. - They had access to quantum slipstream briefly in Hope and Fear. - They had a couple jumps during Dark Frontier. - They moved at enhanced speeds for a little while to catch the Equinox. I didn't go back to see just how off-kilter they are, but it's gotta be pretty big based solely on assertions made in Equinox. * Watching Reg here is awkward, but not as awkward as previous occasions. I'm glad they didn't have all the women on the crew in love with him, especially on the heels of Tinker, Tenor, Doctor, Spy. All the same... Reg is Not Well, and it was always pretty awkward to watch for me. (I didn't like it on TNG either.) His meltdown with Troi is pretty believable, and therefore uncomfortable to watch - I felt really bad for her, alone in his house while he rants about irrational stuff. This was the last episode of Star Trek to air in the 1990s. But I was watching Voyager semi-regularly in its original run, and remember this episode specifically, and recall thinking "of all the familiar characters in the Alpha Quadrant to contact, it couldn't be Geordi or Data or Sisko or even Ensign Ro, no, it had to be Broccoli".